Bali Cascades Restaurant is located at The Viceroy Bali Ubud. 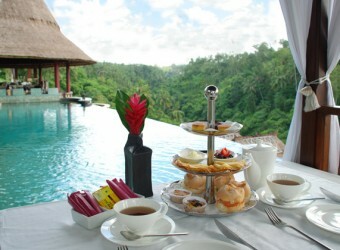 An open dining restaurant overlooks the stunning nature scenery in Ubud. Guests can view the beautiful lush green valley from the restaurant's seats, also relax and enjoy delicious food. Cascades takes local ingredients and Asian ingredients to make French food. The restaurant also offers more than 160 different types of wines from around the world. Restaurant in Viceroy Bali hotel that`s said the most amazing fine dining in Asia. It`s a restaurant overlooking the beautiful valley. There is a wide selection of drink menus available, but it just has smaller number types of dishes than I thought. The prices of the menu are high, start from 1000yen to 5000yen. All dishes are beautifully served and delicious.